Ralph Starling is Minister of Christian Invitation at Richmond’s First Baptist Church, and one of those people who genuinely loves others and wants them to know the life-giving and life-changing love of Christ. I want you to read what he says about radical hospitality, and his plans to teach a class this spring that will train ordinary people to offer the extraordinary welcome of Christ to others. Ralph never wants to hear Jesus say, “I was a stranger, and you didn’t welcome me” (Matt. 25:43). Welcome to The School of Radical Hospitality! You may have noticed that Spring is just around the corner. Major League baseball players have already gathered to practice: batting, catching pop-flies, fielding ground balls, throwing, and running the bases. Players that repeat these fundamental practices know that these exercises will help improve their game. The same is true for congregations. Growing churches are constantly learning. This Spring our church is offering our own version of spring training–The School of Radical Hospitality. This four-week class offers basic spiritual practices for everyone: pastors and staff, leaders and volunteers, members, and even guests. The School of Radical Hospitality will challenge us to be shaped and formed in the image of Christ. We practice hospitality by seeing the good in other people and accepting them just as Christ has accepted us. St. Augustine challenges all followers of Christ by saying, “Have Christian eyes.” He admonishes us to see others through the eyes of Christ. Amazing things will happen if we become available to others, radically available. The School of Radical Hospitality is inviting our people to open their hearts and minds to new learning and possibilities for our church. It is our desire to love the people Jesus loves. Imagine what would happen if people took Jesus’ words seriously. We would change our behavior toward strangers if we lived as if we really believed this! Jesus says, “I was a stranger and you welcomed me” (Matthew 25:35). “Just as you did it to one of the least of these who are members of my family, you did it to me” (Matthew 25:40). The disciples often drew boundaries and distinctions that kept people at a distance from Jesus, reminding Jesus that some of those people were too young, too sick, too sinful, too old, too Roman, too blind, or too Gentile to deserve his attention. Jesus teaches, “Whoever welcomes one such child in my name welcomes me” (Matthew 18:3). In every instance, Jesus radically challenges the disciples’ expectations by over-stepping the boundaries to invite people in. Hospitality has us seeing people as Jesus sees them and seeing Jesus in the people God brings before us. If you are ready for a new adventure in learning to love people like Jesus, then join us for spring training in the School of Radical Hospitality. Let’s welcome all God’s children to the body of Christ! To register for this class contact Ralph Starling at 804-358-5458 ext.134, or email him at Starling@fbcrichmond.org. • Brochures available at the kiosks at First Baptist Church, or can be mailed to you upon request. This year-long, every-member mission trip called KOH2RVA isn’t the way we’ve always done missions at Richmond’s First Baptist Church. When the church was founded in 1780 I’m guessing that its mission was to provide a place of worship for Baptists moving to the new and growing city of Richmond. As the Baptist mission moved west, onto the American frontier, I’m guessing that the people of Richmond’s First Baptist Church supported that movement (I really need to ask our historian, Virginia Darnell, about these things. She will know). When the Triennial Baptist Convention was formed in 1814, it provided a new way for Baptists to work together to support the foreign missions effort. By collecting offerings that would send missionaries to places like China and Africa, Baptists from many different churches could cooperate in a common venture. When Baptists split into two groups in 1845, largely over the issue of slavery, Richmond’s First Baptist Church became a part of the Southern Baptist Convention, and for the next 150 years we did missions the SBC way. In fact, the Foreign Mission Board of the Southern Baptist Convention was “born” in the basement of First Baptist Church. Baptists “split” again in the early 1990’s, but this time First Baptist Church kept its tent big, making a way for its members to support missionaries through the Southern Baptist Convention or though the newly formed, and more moderate, Cooperative Baptist Fellowship. It was around that same time that short-term, volunteer mission trips began to be so popular. “Ordinary” church members (not professional missionaries) began to come home from mission trips to faraway places talking about the work they had done, the things they had seen, and the people they had met. When I came to Richmond’s First Baptist Church in 2008 there were 18 mission trips on the church calendar. At our annual staff retreat in May 2012 Lynn Turner suggested we take the whole church on a mission trip, and the only place we could get everybody to—physically—was Richmond, Virginia. • We haven’t stopped providing a place of worship for people who live in the Richmond area. • We haven’t stopped supporting missions on the American “frontier” (we take up a special offering every year for North American missions). • We haven’t stopped praying for, raising money for, or sending foreign missionaries (in fact, the amount of money we give to global missions each year is staggering). 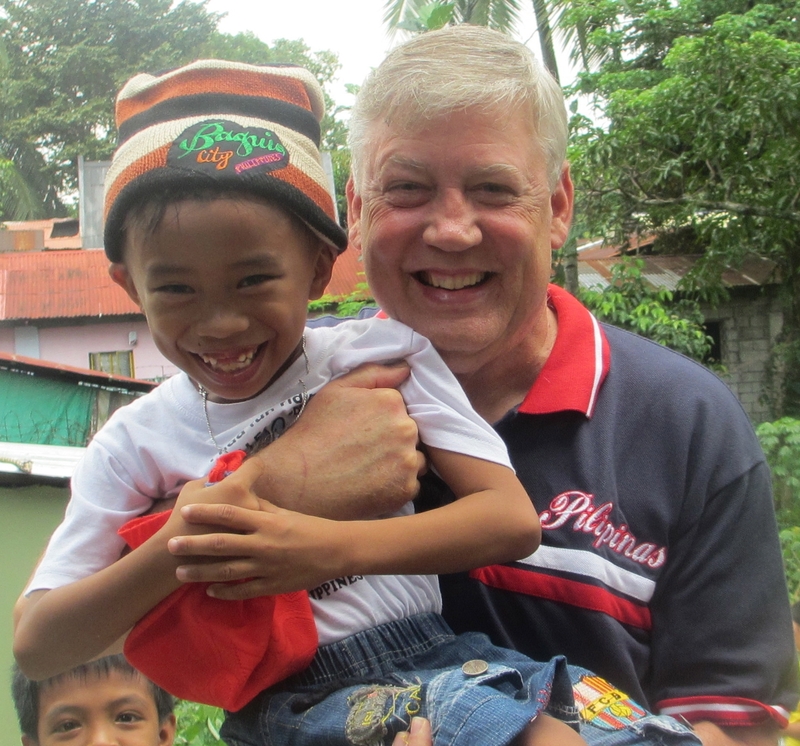 • We haven’t stopped supporting missionaries through the Southern Baptist Convention. • We haven’t stopped going on short-term, volunteer mission trips to places beyond Richmond. But we have started doing this other thing, inviting every member of First Baptist Church to find a way, this year, to help bring the Kingdom of Heaven to Richmond, Virginia—this place where we live, this place that we love. For many of them, it’s the first time they’ve ever been directly involved in missions, in a roll-up-your-sleeves-and-get-your-hands-dirty way. And for many of them, it’s been love at first blister. I think Jesus wants us to worship, and pray, and love, and serve, and give, but I also think he wants us to go. Thanks to KOH2RVA we don’t have to go very far to get a taste of what his mission is all about. Yesterday I blogged about some second-graders who are bringing heaven to earth. Today, Nancy Pettigrew writes about the remarkable fifth-graders at Richmond’s First Baptist Church. You don’t have to be old enough to drive a car, write a check, or lead a team to be part of KOH2RVA. Not if you’re in FBC’s 5th grade Sunday school class. The class has been Christmas caroling for decades. They began caroling for Ann and Garnett Poindexter in 1986 when Garnett was ill, and they have continued for Ann every year since. Everyone they visit values the children’s gift of time. Dr. George Modlin, former president of University of Richmond and long-time FBC member, showed his appreciation by always dressing for them in a three-piece suit. The fifth graders discovered they don’t always have to be physically present either. When one woman had to travel on caroling night, the children sang to her via cell phone. Sometimes the caroling relationships move beyond the Christmas season. 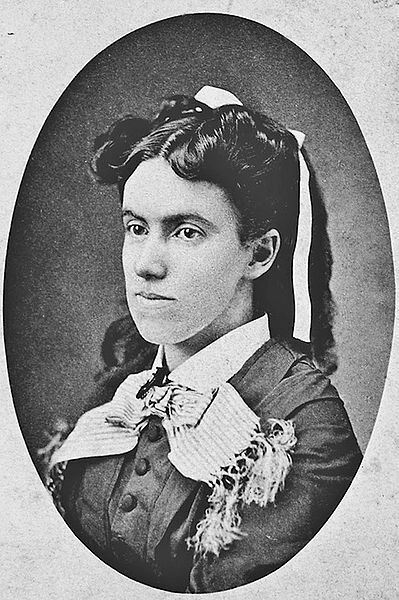 Marion Lawton lived on Grace Street just two blocks from church. Three or four times each year the class went to her home for their Sunday school lesson. For her 100th birthday, the children wheeled her to church to celebrate with a party for her. In the fun of celebrating the holidays, the class doesn’t miss the bigger point, the KOH2RVA point – building relationships with our neighbors based on God’s love. 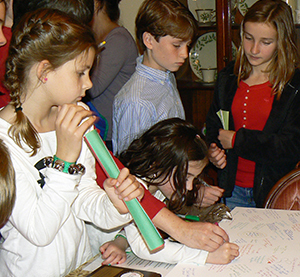 In 2012 the class visited David and Kathy Glass. Because David has ALS, the children wrote him messages of promised prayers for him and his family. 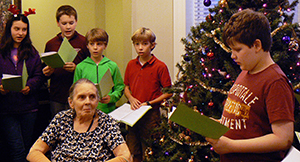 At Lakewood Manor, they used their caroling to connect with some of the families from FBC. Those connections extend a sense of family to the next generation. And this fifth-grade caroling is crossing generations in other ways. Amy El-Khouri, the music teacher on the fifth grade team, remembers caroling when she was in 5th grade. It’s such a good memory that in 2012 she brought her daughters, Emma (6) and Madelyn (4), to start the next generation on the caroling tradition. Nancy PettigrewNancy Pettigrew has taught 5th grade Sunday school for 28 years. She has also worked in other areas of the Children’s Ministry and in children’s choirs. Nancy leads the Prayer Ministry Team, is active in Catalyst Prayer and is a First Responder. There was a knock on my door at church yesterday sometime between the 8:30 and 11:00 worship services (also known as the Sunday school hour). Sometimes I’m in Sunday school, teaching a class or visiting, but yesterday I was in my study, doing a hasty re-write of the sermon. There was a knock—two sharp raps followed by a dull thud. I opened the door and found Julia Wass standing there, right about waist-level. Julia is in the second-grade Sunday school class, and she came to see me along with some of her classmates and their teacher, Larry West. “Somerville!” Julia chirped, cheerfully (sometimes she calls me “Dr. Jim,” but I enjoyed this variation on the theme). Mr. West handed me a piece of paper and I sat down and read it aloud. It was an announcement about a bake sale the second-graders are having next Sunday. Apparently there’s a woman in the neighborhood who can’t walk very well because the bones in her feet have shifted and she needs special, orthopedic shoes. The second-graders are trying to raise money to buy those shoes. I was proud of them, and I told them so, but I was also proud of teachers who would try to help second-graders understand that they, too, could be part of our year-long, every-member mission trip, that in fact they should be. I told Mr. West so. Later in the day I went running with the Monument Avenue 10K training team from First Baptist and Julia’s mom was one of the runners. “Julia came to my office today,” I said. And she acknowledged that she had seen the announcement, and had already started wondering how she would bake two dozen cookies with all that she has going on this week. She thought maybe Julia’s big sister could help. Another update from Karen, who had a hard time finding her way “off the bus and onto the mission field,” but who now seems completely at home. Look at her! See that smile on her face? That’s what joy looks like. Find out for yourself by joining First Baptist Church’s year-long, every-member mission to bring the Kingdom of Heaven to Richmond, Virginia. It’s only Day 168. There are 197 days left! 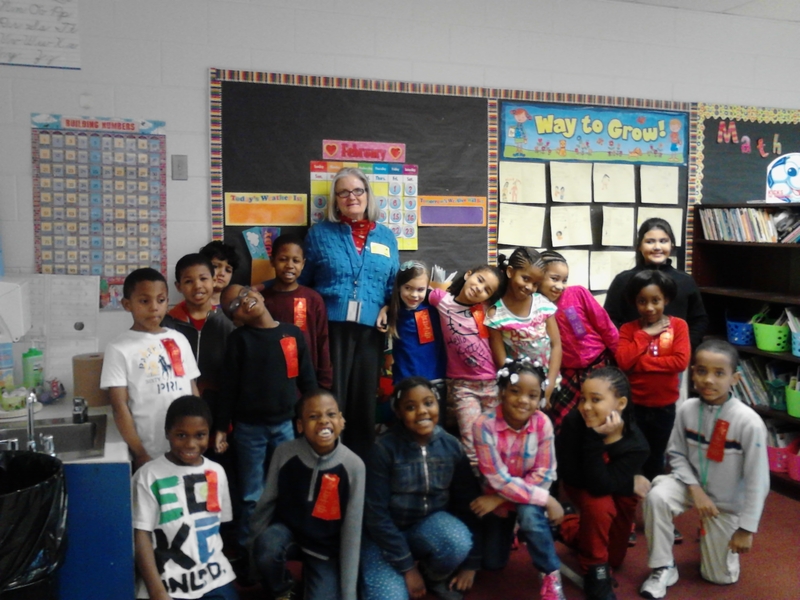 It was a real pleasure today to read to Ms. Knox’s second grade class at Glen Lea Elementary School. I took two of my grandson Parker’s favorite books. Even though germs were rampant in the group (coughs and sneezes and sniffles), the kids welcomed me with a cheerful hello and loved my stories. It was just where I needed to be today (like your hike on Thursday): sharing God’s love with a classroom of precious children. Yesterday I went to Clark Springs Elementary School to spend some time with my lunch buddy, Jaylen. He brought three little paperback books with him he was supposed to read and so I spent most of the time listening, offering corrections and suggestions from time to time, like, “Why don’t you take a breath when you get to the end of a sentence, Jaylen?” (He’s a very fast reader. 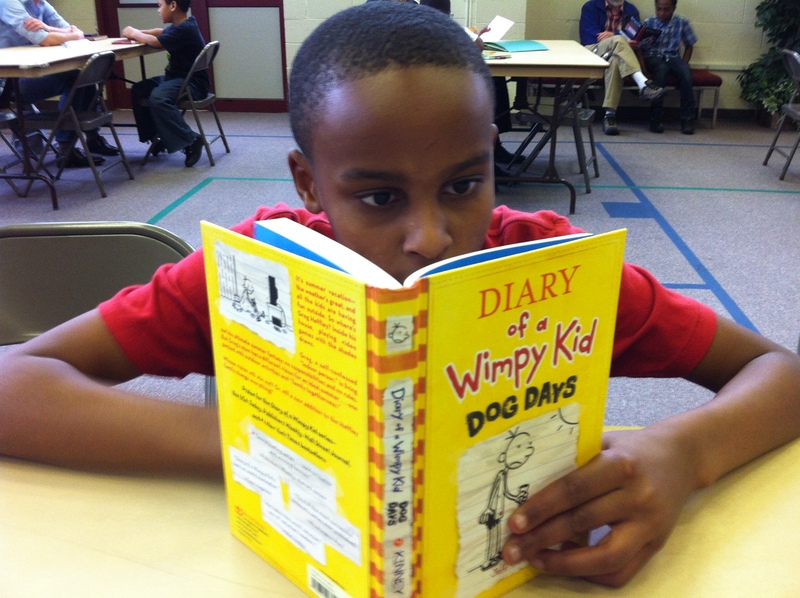 In fact, last time I went I took him the book he’s reading in the picture above, from the Diary of a Wimpy Kid series. He loved it, and read 43 pages while I was there). But on the way back to his classroom Jaylen asked one of the other kids how many books he’d read during the hour. “I read two,” Jaylen said, proudly. I took the whole day off yesterday (well, except for that one little posting incident on my blog. But that was force of habit. It could hardly be helped). And then there was that other thing. It was a nice, sunny day yesterday—cold, but sunny. So, I decided to pack a picnic lunch and take a walk in the woods. I chose the Northbank/Buttermilk Trail loop which goes from the Boulevard Bridge down along the north bank of the James to the Lee Bridge, and then back up to the Boulevard Bridge along the Buttermilk Trail on the south bank. It’s about a 6.3 mile loop, with lots of ups and downs to keep it interesting. My first experience of the Buttermilk Trail was in the fall, when the sunlight filtered through the red, yellow, and orange leaves and fell to the ground in leaf-sized patches of gold. It was glorious. 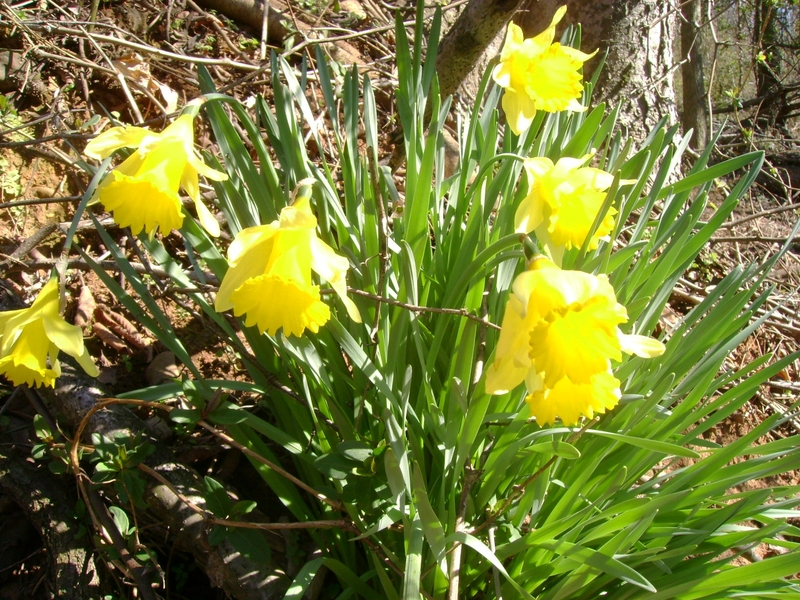 Yesterday’s hike was a little more bare, brown, and wintry, but I was surprised by this burst of daffodil blooms (above) at the place where I stopped to shed my jacket. And there were all those other things to see: a Great Blue Heron gliding to a stop above a tree limb and settling itself there, folding its wings like an umbrella; five Canada Geese diving for something delicious on the muddy bottom of the river, their tail feathers pointing toward the sky; and, to my surprise, the Ringling Brothers and Barnum and Bailey Circus train, parked on a side track (I kept looking for the extra-large car where they keep the elephants and the extra-tall car where they keep the giraffes, to no avail; that may be only in my imagination). But here’s that other thing: as I was getting close to the Boulevard Bridge, near the end of my hike, I saw that some careless hiker or biker had dropped a piece of trash on the trail. At first I just muttered under my breath and walked on by. I had seen so much beauty on my hike, and it had done so much to restore my soul. It was like this perfect moment in time I was going to frame and hang on the wall of my memory. But then somebody threw a piece of trash on it. I could have just picked it up. I should have. But it didn’t look like the kind of trash you would want to touch with your hands. I had a trash bag in my pack, but I didn’t really want to unbuckle everything, set it down, open the pack, take out the bag, and poke the trash into it with a stick. That seemed like too much trouble, and I was almost to the end of my hike. So, I kept walking, but as I did I remembered something I’ve said at Richmond’s First Baptist Church over and over again: “How do you bring heaven to earth? It’s simple. Just look around for anything that doesn’t look like heaven and then roll up your sleeves and go to work.” Well, that piece of trash on the trail didn’t look like heaven. In fact, I thought, “In heaven there won’t be any trash on the trails.” And so I went back, dropped my pack, and did all those things I had been reluctant to do before. Now, that seems like a small thing, doesn’t it? I picked up a piece of trash. Big woo. But think about it: if everybody who threw trash down began to pick it up; if everybody who cursed others began to bless others; if everybody who hurt others began to heal others; if everybody who hated their neighbors began to love their neighbors; if everybody who hated God began to love God…heaven would come to earth. I believe that’s what Jesus was after, really: inviting the whole human race to join him in the redemption of the world God loves rather than its destruction. Picking up a piece of trash is a tiny thing, but it’s a tiny thing in the right direction.